This elegant and spacious Suite has been designed to provide families with the ultimate in luxury accommodation in a lush tropical setting. Opening onto a beach and sea view, it has ample room for two adults and two children (as from 6 years) with all the modern amenities necessary for a memorable stay. The Ocean Beachfront Family Suite offers a comfortable and inviting atmosphere and is characterized by clean lines and a fresh, light feel. A subtle blend of soft hues and stylish light wood furniture adds a sense of space and airiness to the living areas. 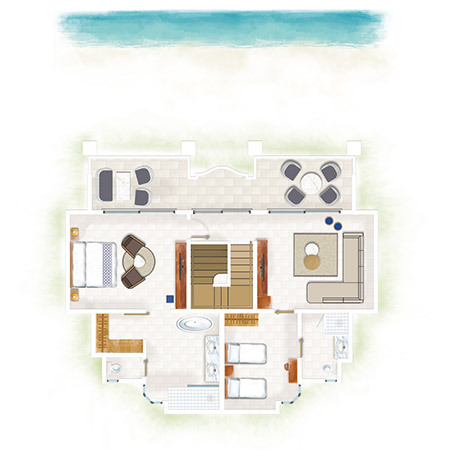 The extensive layout comprises a substantial lounge area, two bedrooms and two fully fitted en suite bathrooms. There is something for every family member. A private terrace also allows for outdoor living in spectacular surroundings.